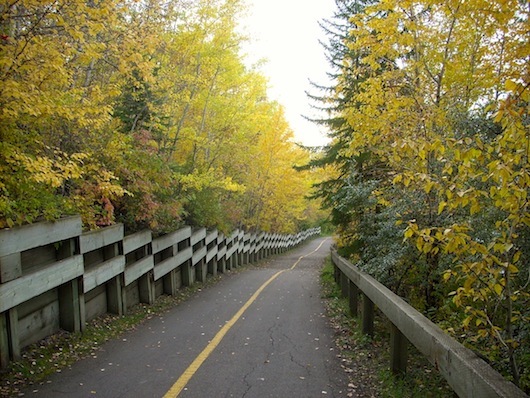 The 2 km jaunt along the Mill Creek Ravine is a ‘tributary’ path of the N. Saskatchewan River and is one of Edmonton’s more popular running spots. Start near the Muttart Conservatory, which has lovely botanical gardens worth a visit. From the parking lot at 98th St. & Connors Rd. NW, enjoy the main paved trail for this 4 km round-trip run, with easy options to add on. Add-Ons: Paths and parks along the N. Saskatchewan River. Parking lot at 98th St. & Connors Rd. Parking lot at 98th St. & Connors Rd. Also served by bus.